Rouge in Love: the new and very exciting lipstick collection from Lancome. I am very thankful to be trialling this product for Beautyheaven. Jolis Matins- Fresh shades for day time. Has a letter 'M' in the shade number. Boudoir Time- Pop shades for cocktail hour with a letter 'B' in the shade number. Tonight is My Night- Intense shades for magical nights. These have a letter 'N' in the shade number. I received the 159B which looks like an orangey-red colour in the packaging. Swatch of the colour on my skin. There are a total of 21 shades which are said to last 6 hours of wear. I used a lip brush to apply the colour onto the lips as I think I can build up the colour more and be a little more precise. The lipstick is very sheer and glossy when first applied. The colour then dulls down and dries out. It dries to a more pinky/red colour and a little less intense then what you see in the tube. While the colour dries to stain the lips the colour did not flake or crack upon application. It felt very natural and I felt confident that it would keep the colour on my lips. What better way to test a lipstick then expose it to a hard shopping day out at DFO. I first applied the colour at about 1.30pm then we set out the shop till we dropped. The lip colour lasted really great for the first 2 hours, giving solid colour. We arrived home at 4.30pm (3 hours later with lighter wallets) and the colour was looking a little thin. Here is the photo after about 4 hours of wear. The colour had faded a lot but left a pink stain to my lips. 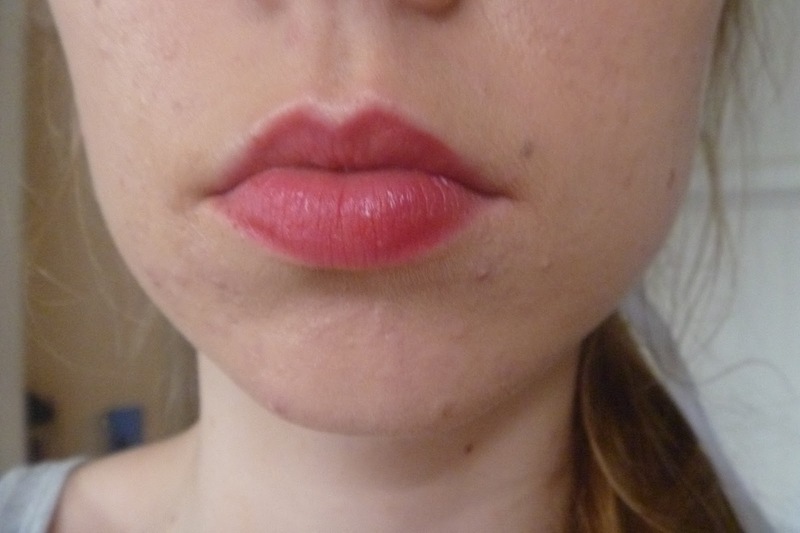 Also around the lip line the colour was more prominent and a little flaky making the colour look uneven. If I was going to wear this colour for longer I would defiantly reapply after about 2-3 hours. I also tested the lipstick at a friends party I attended and it only lasted the for about one hour, after that I didn't feel I had any colour on my lips. I was continuously drinking and my cup was stained with colour. That was a little disappointing but can be expected. It is however the longest lasting lipcolour I have in my collection, much like the one MAC lipstick I own. I am very impressed with this new lipstick from Lancome and I would love to buy another colour very soon. It is priced at about $45 but that is basically what you pay for a lipstick anyway so this is a pretty good deal. See full reviews from other bh members here and decide for yourself. Still not bad for 4 hours of wear - I still haven't had a chance to swatch the Rouge In Love. I love the packaging. This is a very pretty colour and looks great on you. Great review, I really enjoyed reading it. I look forward to adding this to my collection - that colour is gorgeous! I love that color! I own so many shades of lipstick but never get around to wearing them. This looks lovely, such a gorgeous colour. Haven't tried any Lancome lippies yet - I'm scared to, as I know that once I do, I'll be hooked on high end ones and have a very empty bank account! I too got one from BH! and I love it!